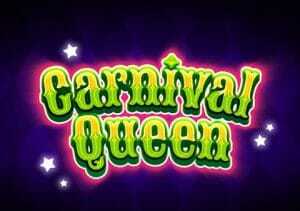 Join a wild Mardi Gras street party in Carnival Queen, a 6 reel, 4,096 ways to win video slot from Thunderkick. Highlights of this celebration include multipliers which increase with each successive Avalanche win and a free spins round with more multipliers, and wilds that can turn losing spins into winners. Play on your PC, tablet or mobile from between 10p and £100 per spin. Thunderkick video slots are usually well designed and Carnival Queen is another impressive looking game. The action takes place against a night time street party backdrop. Joining the A to 9 royal values are a quartet of masked party goers plus a gold crown which is the top payer. Land 2, 3, 4, 5 or 6 of the crown on adjacent reels and you’ll pocket an award of 1, 2.5, 5, 10 or 20 times your total bet. There’s also a wild that substitutes for everything bar the bonus and also offers payouts of 20 times your bet for a 6-symbol combination. The Avalanche feature means that the symbols from a winning combination are removed and new ones drop in and replace them. Each consecutive Avalanche win also increases a multiplier from the Multiplier feature. There’s no limit to how high the multiplier can go. If no new winner ensues, the multiplier reverts back to 1x. Carnival Queen also comes with a Bonus Game feature which is triggered by landing 3 or more bonus scatters anywhere on the reels on the same spin. That will get you 12 free spins – each subsequent scatter on that triggering spin adds another 4 free spins to your total with 24 up for grabs initially. The Avalanche reels are in play during the feature. The slight wrinkle here is that the multiplier doesn’t revert back to 1x after a winless symbol drop. It can only increase! The other extra to look out for here involves the wild. If one of these hits on a winless free spin, all the symbols on the same reel and row as the wild are removed. A new Avalanche drop then follows, giving you another chance to land a win and hopefully get on a winning roll. Landing 2 or more scatters on the same free spin results in more free spins too – there are no limits to free spins and subsequent multipliers! We enjoyed this Mardi Gras extravaganza. There’s nothing you won’t have seen in other Avalanche reels video slots but it’s all very well put together. The visuals are as impressive as usual and there’s enough action on offer to keep this party chugging along nicely. The variance is in the medium range but you can win 22,700 times your bet on every free spin! If you like symbol drop games, then Carnival Queen is one party you won’t want to miss. I would also suggest NetEnt’s Gonzo’s Quest which is quite similar in terms of game engine.